Perhaps I would make a good pilgrim. There is no other real reason (excepting madness) to explain why, on an icy Saturday when the snow out in the countryside was still almost knee-deep and most roads – let alone the hiking trails – required a Herculean effort to negotiate, I should decide this was the time for doing a hike I’d long talked about: the route to Marianka, a village on the other side of the first wave of the Malé Karpaty hills that rise behind Bratislava, which happens to be Slovakia’s (and one of Central Europe’s) biggest and oldest pilgrimage destinations. Pilgrims like arriving the hard way, right? 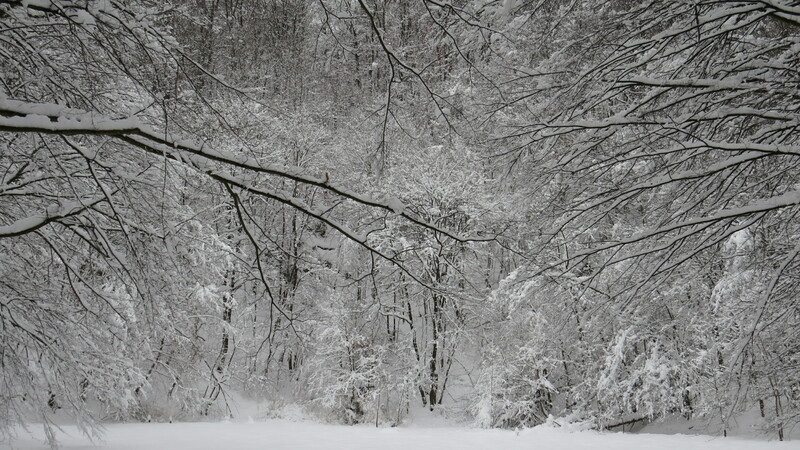 Crawling; in bare feet; backwards… snow as thick as what I ended up traipsing through certainly required plenty of determination – and perhaps a touch of devotion. I was also, quite possibly, spurred on through the white because I love hikes with themes: aimless forest or mountain rambles are fine, but when they can be done to follow in historic footsteps, it adds an interesting dimension. For these reasons (interest, great scenery) this is a walk worth considering for any visitor to Bratislava who feels like a rewarding leg-stretch during their stay. And you will not find more radiantly beautiful countryside so close to the city. The way to Marianka has in fact been tramped by the devout for almost a millennium and weaves in a colourful history involving some famous names (Holy Roman Emperors Leopold I and Joseph II – son and successor of Maria Theresa). Over such a lengthy period, it’s little surprise that an official pilgrimage route became defined. This begins at Bratislava’s rather nondescript Kalvaria and continues past a small cave, Lurdská Jaskyňa (Lourdes Cave; a slight exaggeration on the part of the namer) before ascending into the hills via Źelezná Studnička and Kačín to get to the pilgrimage site. Having had, since I first mastered the art of walking, a loathing of “official routes” I have to confess to absolutely out-trumping (and out-tramping!) the pilgrims here with a far prettier route (although it totally circumnavigates the Kalvaria and Lurdská Jaskyňa) that starts at the tram stop of Pekná Cesta (served by trams 3 and 5 from the centre). Sometimes these pilgrims can’t see the best woods for the trees. From Pekná Cesta it’s a straight walk up passed the supermarkets to the mini roundabout at the top, then on again along the narrow lane which eventually ascends to the main Pekná Cesta entrance to Bratislava’s Mestké Lesy. 200m up here, a stony track cuts up from the lane plunging you immediately into forest. This is the yellow path which you will be following (in my rather sodden footsteps) for the next two hours of hiking. It ushers you along the rear of some new-builds, skirts around to the right of a picnic area and then, where the better forest track swings round to the right, branches steep left up through the forest on a far smaller path. It was a route, on my snow-encumbered pilgrimage, much frequented by families trying out rather fetching sledges, not to mention a few snowshoers and nordic skiers – but also a surprising number of very determined single older men going it alone with just walking poles and their own two feet. Age required I give way to them, and given there was only a thin strip of semi-beaten path between the knee-deep banks of snow either side, giving way meant getting wet (talk about penance). This stretch of the yellow trail skitters up through the woods like a back-to-front slalom course, then more or less follows contours about three quarters of the way up the hill on a pleasant little path for almost an hour before reaching the crossroads with the red trail, at which point you are a 25-minute walk from Kamzík. *** On the next leg, straight over the red trail and down to the Kamzík cable car base above Źelezná Studnička, there was only one intrepid set of steps in the snow before mine, and going was very tough, although again hauntingly beautiful, with the snow-laden pines emphasising the silence, broken only when the weight of snow on branch became too great, and the trees shed their load in a snow shower to the forest floor. Down on the forest road near the cable car base there was more activity. I turned right and followed the road gently up through woods which are normally classic picnicking spots to the end of the drive-able stretch (and terminus of the seasonal bus 43) by the old sanatorium, which with its long-drained swimming pool and closed-up buildings creates a slightly eerie feeling in otherwise unspoilt and increasingly lonely woods. At some point up this valley, the reins of civilisation that gentrify some lower slopes of Bratislava Mestké Lesy are dropped, the picnicking spots thin and the other people you pass become increasingly hardier hikers, rather than families or afternoon strollers. You pass two disused quarries, but before the main forest road reaches a third quarry, and after about 45 minutes’ walk on what is normally a metalled track but now was little more than a mound of ice and snow, a notice board and deserted cottage mark a division of paths. Here, the yellow route nips up through a break between trees for a further 45 minutes to join the red trail and bona fide pilgrimage path from Kačín (the latter another major picnicking spot at the north-western limit of Bratislava Mestké Lesy). For me, the last part of this route along the top was in virgin snow – stunningly winter wonderland-esque, but further soaking by already damp shoes and trousers. It was time to bring that time-honoured weapon of devout pilgrims into play: a hip flask of strong liquor, in this case becherovka. A generous swig, and I beheld a vision: a sign post which told me I was only one hour from my goal. As it turned out, it was slightly less. The route from hereon was either level or downhill and again, through snow-bowed tunnel after snow-bowed tunnel of trees, in gorgeous forest scenery. Now on the official pilgrim trail, there were also a couple of shrines – the most impressive at Sekyl, the point where red and yellow routes separates, with yellow descending to Záhorská Bystrica and red – our route, zigzagging down through the trees. 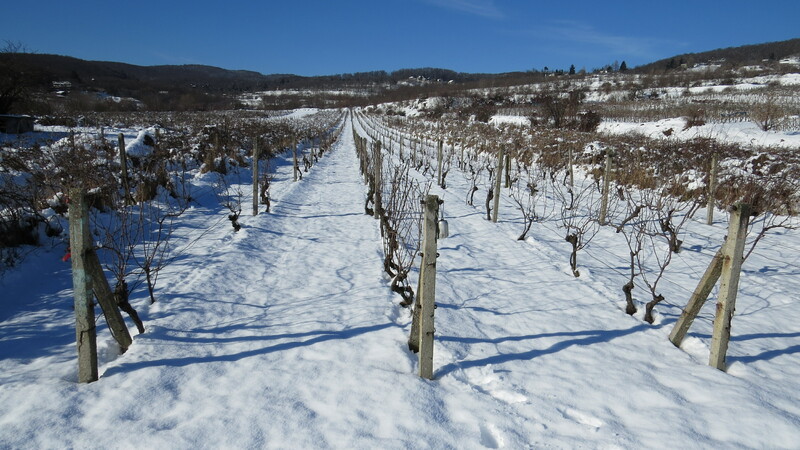 On this chilly but bright afternoon, it would have made a great cross-country ski but was a struggle to walk, although the views that soon open out – of the flat western tip of Slovakia stretching away through farmland into Austria – are ample compensation. 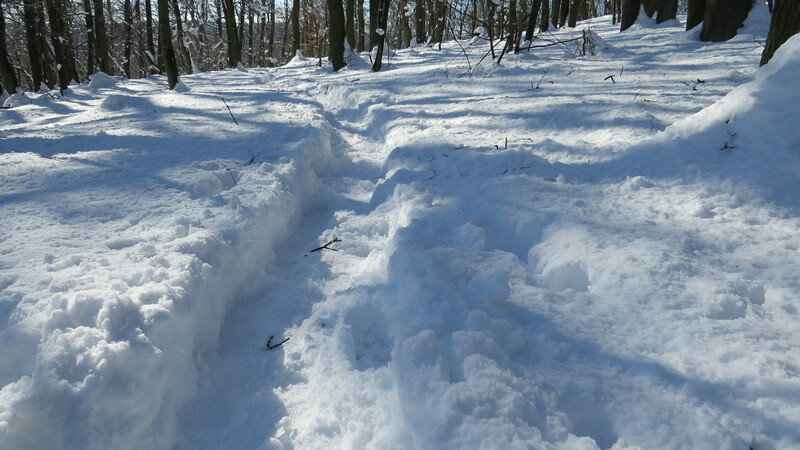 And soon, at about three hours-worth of snow-walking (or slightly less in normal conditions) the path skitters down to pass the uppermost of the mountain cottages (chaty) signalling the beginnings of Marianka. The path turns into a track, and the track a lane (Šturová). Follow this lane, ignoring any side turnings, which will bring you down, with many kinks (as this is a very spread-out place) via the first of the town’s many shrines, to Marianka’s lekáreň (pharmacy) – then abruptly ascends to meet the main road from Záhorská Bystrica. Turn right at this crossroads, and you are gently ushered into the venerable old centre of Slovakia’s number one pilgrimage site. Weary pilgrim, fear not. Your endeavours will not have been in vain. Marianka’s reputation does not rest on thin air. Accordingly, our post on Marianka itself will be here soon! NB: The bus stop which becomes immediately obvious in the historic centre of Marianka has connections (on bus 37) back to Bratislava every two hours – useful return times to be aware of are 3:04pm and 5:24pm. GETTING THERE: Start from Pekná Cesta (take tram 3/5 from the centre) or, more conventionally, from Kamzik (take trolleybus 203 from Hodvovo Namestie to the end of the line then walk up. From Kamzik, take the paved lane on down towards the cable car base on the other side of the hill from Bratislava (not a public road, but nevertheless shown on maps one and two). At the cable car base, you’re on our route (a point underlined for your benefit above). *** Denotes where, in the separate linked post, you have to scroll down to find the same point described.